A bass player’s solo album I hear you say? The bass player is the guy responsible for keeping the beat, the one playing the guitar with the four thick strings … right? Well to an extent yes. But assumptions are such dangerous beasts, closing the mind to a myriad of possibilities. What happens however, when the bass player comes up front, takes the lead on a six string bass, plays the melodies and writes most of the songs? What happens when that bass player is Wayne Jones? Wayne has been an active fixture on the Australian session circuit for the last three decades with backing credits attached to artists as diverse as Geoff Achison, Ian Moss, Dave Hole and Kate Ceberano, as well as an array of film, television and bass clinician work under his belt. Finally, after first entertaining the thought of releasing a solo album around seven years ago, and with the assistance of Cre-8-Sound studios, Wayne delivers ‘Forgotten Melody’ a jazz tinged, funk and groove based feast, utilising some of Australia’s finest session players. Joining Wayne in his symposium of sonic sophistication are guitarist Ron Peers (Stylus, Renee Geyer), drummer Gerry Pantazis (Tommy Emmanuel, Bachelor Girl) and WA’s James Sandon on sax (GMA). Keyboards and co-production kudos goes to Ash Crick, who at one time was the fastest person on earth.True! Apart from playing with Tommy Emmanuel, Dale Ryder and Funk Fiction, Ash is a former world champion sky diver and was officially noted as the fastest person in the world in any non-motorised sport in the year 2000 when he free-fell at 500km per hour (the record has since been broken). From the opening few bars of track one of this album, the chuggalong “Tom’s Shuffle’, there’s no disputing Wayne’s amazing command of the bass as he plucks and slaps with a fluidity and freedom that many others could only ever aspire to. While Ron, Ash, and James provide feel good melody flashes, and Gerry keeps it all tight and together, Wayne can’t help but slide out of the pocket and into the forefront with some astonishingly liquid bass licks. With track two, the title track “Forgotten Melody”, Wayne slips into something more sublime. It’s an after dark jazz cocktail featuring Wayne’s lead melody on his Status six string with the immaculate production values capturing every resonance of his strings. ‘Gone for a Walk’, ‘Hole in My Pocket’ and ‘Written Hour’ follow, each providing a joyous vibe, a fusion of early morning anticipation and late night romance or reflection. You’d be forgiven for thinking a wide variety of basses and effects were used to conjure the dynamic sounds offered on this disc, however for the most part, it’s one bass, and all fingers and thumbs with only a hint of studio tweak. Anyone who has ever cast doubt on the bass’s ability to take on head chef duties, need only listen to the concoction Wayne cooks up on his unique funkified version of the jazz standard ‘Take Five’. Whoever said precision and passion don’t mix! By track ten, the album’s closing celebration “In Full Flight”, the listener is left in no doubt as to the astonishing bass talents of Mr Jones. Wayne Jones knows bass. So much so that in conjunction with Michail Barabasz, designed his own Wayne Jones model bass cabinets which have received rave reviews in international musician magazines. Proof is in the pudding they say, and engineer Steve Scanlon was so impressed with the Jones’ speaker cabs, he mixed this album through them. 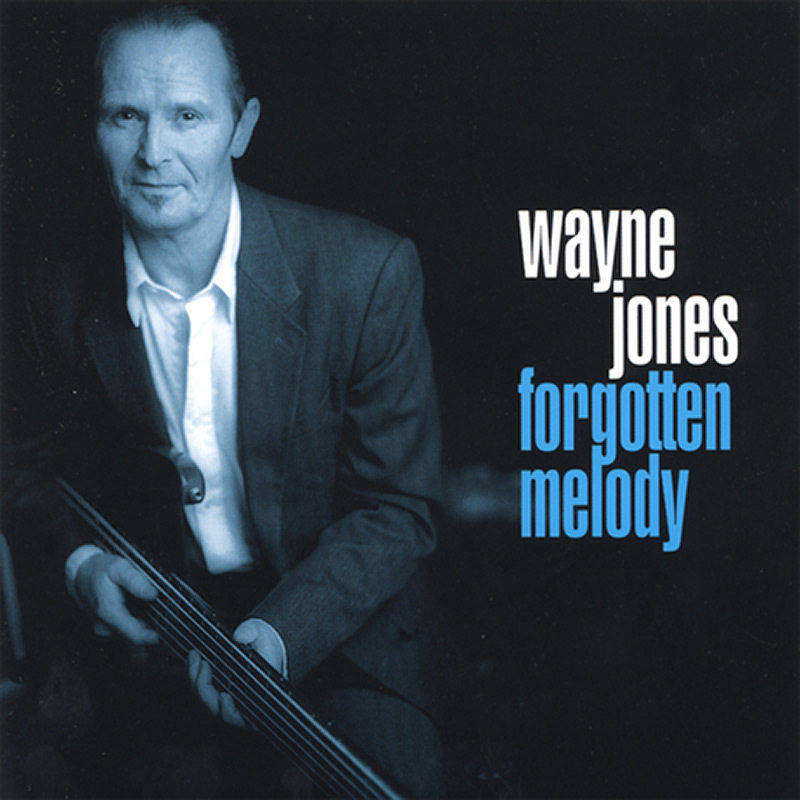 “Forgotten Melody” is all Wayne Jones, all class … world class in fact! First off, you need to know that this is a smokin’ album! From Down Under (Melbourne, to be exact) comes one of the hottest bassists I’ve heard, who’s assembled an astonishing collection of tunes and performances for this new one. Wayne Jones (by the way he also designs some of the most highly-regarded bass enclosures on the market) has released his first solo project, FORGOTTEN MELODY. It’s dynamic, fresh, and above all, classy. Wayne’s been a top-shelf player in Australia for over 30 years, and brings a group of other World-class Aussie players aboard for this project. The result is amazing. For example, all the low-end you hear on this album comes from Wayne’s Status 6-string and his Maton M.G.B. 4 fretless instruments, with minimal studio enhancement. Basically it’s all fingers and thumbs! The song choice is superb… six Wayne Jones originals, two from his buds, and a couple of killer covers, namely Paul Desmond’s “Take Five” and Marcus Miller’s “Run for Cover.” The flow on FORGOTTEN MELODY is extraordinary too, by design… from the high-intensity “Tom’s Shuffle” to the mellow and engaging title track (the first single) right on through to the passionately energetic finisher, “In Full Flight.” Wayne says, “I looked at the progression on this disc like I would plan a show… you have to start with good impact, then go on a journey of moods to the climax.” The title may be FORGOTTEN MELODY, but Wayne Jones’ debut album is glowingly memorable! Over the last three decades, Jones has operated in a variety of musical settings. With a frankness that is characteristic, Jones articulates, “You have to play many styles of music here to survive.” From original recording and cover bands to freelancing for sessions or for film and TV, the wonder from down under has ‘done it all’! All that is, except issuing an album under his own name. Having first entertained the idea of a solo project around seven years ago, that long-held dream has finally come to fruition with the release of Forgotten Melody. Described as “a jazz tinged, funk and groove based feast” by the editor of Australian Musician Magazine, Jones delivers a fantastic first effort that comes as an extremely pleasant surprise to those of us here in ‘the other hemisphere’ who haven’t previously had the opportunity to experience the craft of this wonderfully gifted musician!! So it’s now with the utmost relish that we place Wayne Jones and Forgotten Melody in our spotlight and to that end we have three tasty melodies that touch upon a variety of influences. First up is Written Hour, a rather engaging play on Lee Ritenour’s surname. That’s followed by the title track at the top of hour 2 while Jones’s own cover of the Marcus Miller classic, Run For Cover draws favourable comparisons to the original, in fact if anything it may actually be a bit stronger. Ash Crick and Ron Peers Gerry Pantazis and James Sandon Funky rhythms abound thruout and with all respect due Mr. Jones, this leads to the inevitable conclusion, the name of the album may be more than a trifle misleading. The project not only injects the music scene with a much-needed infusion of style, substance, and energy, to the contrary of what its title may suggest, Forgotten Melody is also noteworthy and highly memorable as a debut effort! !